In life we come across inspired teachings that represent moments of brilliance that simply make us better. From The Greatest Salesman In The World by Og Mandino, we learn a great secret to success which represents one of those brilliant teachings. I was born to triumph, not to bow my head in defeat. I was born to toast victories, not to whimper and whine. What happened to me? When did my dreams all fade into a grey mediocrity where average people applaud each other as excellent? No person is ever so much deceived by another, as by himself. The coward is convinced that he is only being cautious and the miser always thinks he is practicing frugality. Nothing is so easy as to deceive one’s self since what we wish is always easy to believe. No one, in my life has deceived me as much as I have. Why do I always try to cover my small accomplishments under blankets of words that make light of my work or excuses for my lack of ability? Worst of all, I have come to believe my excuses so that I willingly sell my days for pennies while consoling myself with thoughts that things could always be worse. It is time to study the reflection in my looking glass until I recognize that the most harmful enemy I have…is me. At last, in this magic moment with my first scroll, the veil of self-deceit is beginning to lift from my eyes. Now I know that there are three classes of people in the world. THE FIRST LEARN FROM THEIR OWN EXPERIENCE – THESE ARE WISE. THE SECOND LEARN FROM THE EXPERIENCE OF OTHERS – THESE ARE HAPPY. THE THIRD LEARN NEITHER FROM THEIR OWN EXPERIENCE NOR THE EXPERIENCE OF OTHERS – THESE ARE FOOLS. I am not a fool. Henceforth I will stand on my own feet and my terrible crutches of self-pity and self-contempt have been cast aside forever. NEVER AGAIN WILL I PITY OR BELITTLE MYSELF. How foolish I was when I stood in despair, by the side of the road, and envied the successful and the wealthy as they paraded by. Are they blessed with unique skills, rare intelligence, heroic courage, enduring ambition, and other outstanding qualities that I possess not? Have hey been allotted more hours, each day, in which to perform their mighty tasks? Do they have hearts full of compassion and sols overflowing with love that are different from mine? No! God plays no favorites. We were all fashioned from the same clay. Now I also know that the sadness and setbacks of my life are not unique to me. Even the wisest and most successful of our world suffer chapters of heartbreak and failure but they, unlike me, have learned that there is no peace without trouble, no rest without strain, no laughter without sorrow, no victory without struggle and that is the price we all pay for living. There was a time when I paid the price willingly and easily but constant disappointments and defeats first eroded my confidence and then my courage even as drops of water will, in time, destroy the strongest granite. All that is now behind me. No longer am I one of the living dead, remaining always in the shadows of others and hiding behind my sorry apologies and alibis while the years waste away. Success, when it comes overnight, often departs with the dawn. I am prepared, now, for a lifetime of happiness because I have finally recognized a powerful secret hidden in the years that treated me so harshly. FAILURE IS, IN A SENSE, THE HIGHWAY TO SUCCESS, INASMUCH AS EVERY DISCOVERY WE MAKE OF WHAT IS FALSE LEADS US TO SEEK EARNESTLY AFTER WHAT IS TRUE AND EVERY FRESH EXPERIENCE POINTS OUT SOME FORM OF ERROR WHICH WE SHALL AFTERWARD CAREFULLY AVOID. THE PATH I WALKED, OFTEN DAMPENED BY MY OWN TEARS, HAS NOT BEEN A WASTED JOURNEY. Thank you God, for playing your game with me, today, and placing in my hands these precious scrolls. I was at the lowest ebb of my life but I should have known it is at that moment that the tide always turns. No longer will I look mournfully to the past. It will never return. Instead, with these scrolls, I will shape the present because it is mine and I will go forth to meet the mysterious future without fear, without doubt, without despair. I was formed in the image of God. There is nothing I cannot achieve if I try. Many years ago there lived a man by the name of Thadeous. He lived with his family in a fairly large and prosperous city. Being a trader, Thadeous enjoyed much of the wealth associated with property of the city. By some means Thadeous had been taught the principles of the Lord by his father and had been a good man in keeping the commandments. As Thadeous was returning from a trading voyage, the Lord called him to be a prophet. The Lord told him that he must warn the people and call them to repentance. He told Thadeous of the great wickedness and sin that had come over the people. He was to teach his family first. As it was late when Thadeous returned home and his wife had retired, he decided to tell her about his vision in the morning. As dawn came he arose early and started to prepare the goods he had brought for distribution to the various shops throughout the town. He forgot, for a time, the vision. Several days later a voice came to him and said, “Thadeous, tell your family about your calling and warn them of their sins, that they will be able to repent.” So Thadeous reported his vision to his family and explained to them his calling to warn the people of the city. His family thought this was exciting, but his wife explained that it would probably be better to wait until after the big celebration next week. The people would be more receptive to changing their ways after the festivities. As he arose the next morning, the thoughts of his business soon occupied his mind and hie forgot his calling. Later in the evening one of his children reminded him of his vision and he said, “Yes, I must go now.” He went to one of the local gathering places. The people had begun to liven their spirits in anticipation of the celebration. He agreed with his wife, it would be better to wait until after the holiday was over. One more trading trip was planned which again took precedence over his calling. As Thadeous visited a trading area not too far from his town, he heard much talk about a man called Noah who was stirring up trouble by telling the people of their sins. Here Thadeous renewed his determination to call his city to repentance as Noah was doing. He wondered if they would be as angry with him as the people in Noah’s area seemed to be with Noah. 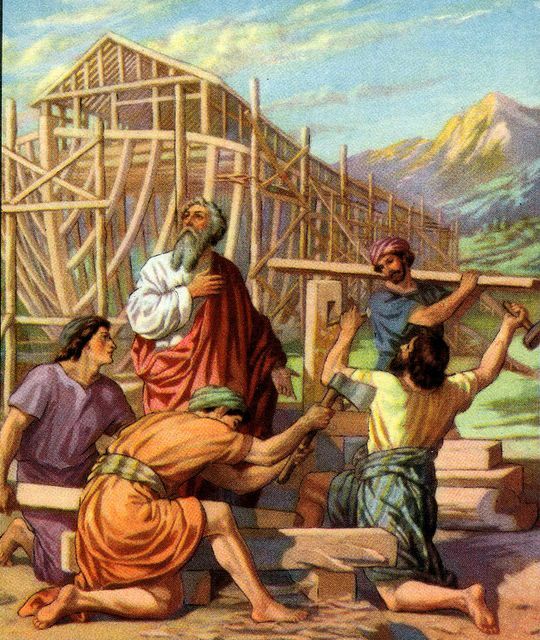 As he was preparing to leave to return home, another trader came in with a report that Noah was now building a boat. Everyone laughed long and hard at this. The next morning Thadeous recounted to his family the story about Noah. Thadeous said to himself that as soon as he was able to sell the goods he had bought he would do as the Lord had commanded. Several days later as Thadeous had finished distributing the last of his goods and was preparing to go home, the Lord called again and said, “Thadeous, you have not warned these people as I have commanded, but tomorrow you must go to the neighboring town and there find the prophet Noah and do exactly what he tells you. Take your family and possessions.” “Yes, I will Lord,” said Thadeous, as he had several times before. When Thadeous returned home he told his family they must leave the next day and take all they had with them and visit the prophet Noah. The next day it was raining and they all decided to leave as soon as it stopped. During our four years in Africa we had the opportunity of going on many Safari adventures. The Lion was always exciting to ‘get up close and personal’ – and exciting to observe them in their ‘homes’. I was reminded of our Lion engagements as I was reviewing the story and lessons attached to King Richard of 12th Century England who was nicknamed the “Lion Heart”. That’s a Cool nickname. The immediate reflection of King Richard was that he was not a wimp. He must have been strong, courageous, powerful, fearless and someone you would avoid ‘angering’ at all costs. Some other heroes of mine who have earned special nicknames would include: Lehi = Visionary, Nephi = Obedient, Ammon= Missionary, Abinadi= Courageous (“Touch Me Not”), Jonathan=Friend, Captain Moroni=”like Unto Moroni”, President Hinckley=Temples, President Benson=Book of Mormon, President Kimball=Miracle of Forgiveness, just to name a few who had ‘Lion Hearts’ in some special way. But, back to King Richard. He earned the right to his nickname and Leadership reputation due to the opportunity history provided him and taking advantage of the opportunities. Richard organized a crusade to the Holy Land to beat up on the Turks. The mission failed and King Richard found himself in prison. While he was cooling his heels, traitors at home took over the government. When King Richard finally escaped from prison he was forced to reenter England, for security reasons, incognito while he quietly gathered a few of his faithful followers to help him put England back into the hands of her rightful rulers. Great Leaders are inspiring and fun to follow, but sometimes hard to find. King Richard had the heart of a Lion and people followed him. Capt. Moroni had the heart of a Lion and people followed him. Abinadi had the same heart and Alma rose up and rebuked his ‘brothers’ and ‘followed’ Abinadi. Peter had the heart of a Lion and on the day of Pentecost 3,000 people stood up and followed him. Nephi had the heart of a Lion on his famous door approach to Ismael and Ismael found his pup tent and followed him to the Promised Land. Ammon stood at the waters of sebus and with the heart of a Lion withstood the enemies of the king. Elder Wilson of Virginia fame stood up to two rule breakers in his zone and courageously, with the heart of a Lion, changed the direction of an entire mission. Every great CAUSE is almost always led by a Lion Hearted Leader. And nearly every Lion Hearted Leader will be found at the head of some GREAT CAUSE. The House of Israel has been identified from before this world was as Lion Hearts, people who had the pre-exisent instincts and desires to team up with GREAT CAUSES and make a major difference: Family, Marriage, Church, Community, Profession, Calling and Neighbors are all Causes that Lion Hearts tackle and usually WIN BIG. King Richard is a GREAT story but it will remain only a story until we DECIDE to put the LION HEART piece of the story into our log book and make something happen. Storm a Castle. Change a community. Create a successful Business. Double the performance numbers. Celestialize a Marriage. Exalt a Family. With love from Heber while loving the story and Life Lessons of Richard, the Lion Hearted King.